An employee prepares to scan a children’s bicycle for a customer at a Wal-Mart Stores Inc. location in Burbank, California, U.S., on Thursday, Nov. 16, 2017. Even though retailers are offering deals earlier and earlier each holiday season, resulting in a “Christmas creep,” Black Friday is still expected to be the busiest shopping day of 2018, by far, according to one retail tracking firm. In addition, the top 10 shopping days of the holiday season are expected to account for almost 45 percent of this year’s holiday visits, according to an annual survey by ShopperTrak. With all that money pouring into the span of just a few weeks, companies still have plenty of reasons to invest in the season. With Christmas falling on a Tuesday, there will be four Saturdays in December, a calendar quirk that won’t happen again for a while. Because of this, ShopperTrak expects the Saturday before Christmas — known as Super Saturday — to be busier this year than in 2017. Because Christmas fell on a Monday last year, shoppers were more pressured to get gifts on the Friday before Christmas. 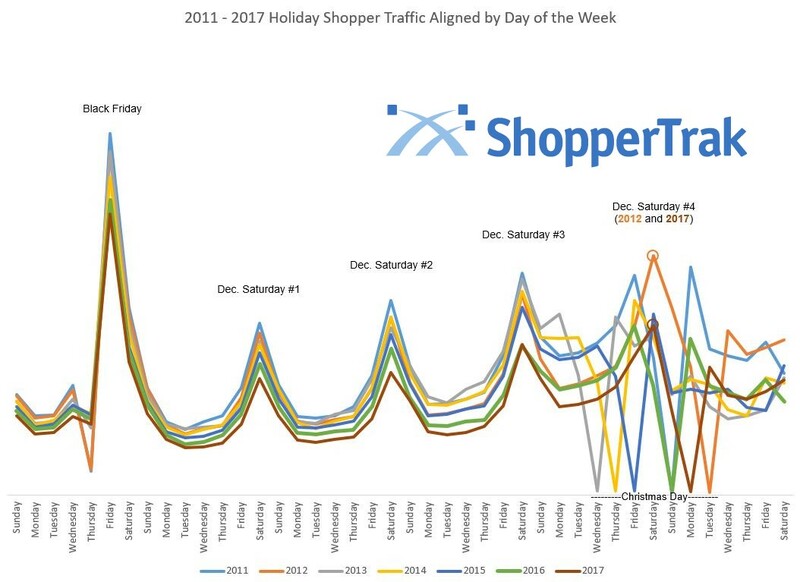 In addition to the busiest days of the holiday season, ShopperTrak looked at the busiest hours. The range of 2 p.m. to 4 p.m. is predicted to to see the most traffic, similar to last year, with 4 p.m. being the peak, the group said. ShopperTrak has been selling foot counters since 2011 to retailers to analyze shopper habits. It makes its projections from previous years’ data. “Ensuring that key merchandise is in stores especially during these 10 days and scheduling associates for the right days at the right times will allow retailers to provide their customers with the intended experience and keep them coming back well beyond the holidays,” Field said.